Mary Clay looked out of the window of the old farmhouse. The view was dreary enough—hill and field and woodland, bare, colourless, mist-covered—with no other house in sight. She had never been a woman to crave for company. She liked sewing. She was passionately fond of reading. She was not fond of talking. Probably she could have been very happy at Cromb Farm—alone. 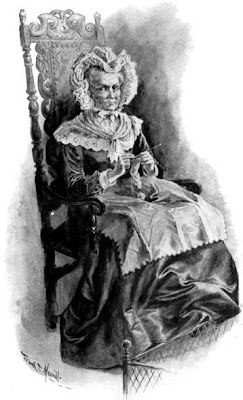 Before her marriage she had looked forward to the long evenings with her sewing and reading. She knew that she would be busy enough in the day, for the farmhouse was old and rambling, and she was to have no help in the housework. But she looked forward to quiet, peaceful, lamplit evenings; and only lately, after ten years of married life, had she reluctantly given up the hope of them. For peace was far enough from the old farm kitchen in the evening. It was driven away by John Clay's loud voice, raised always in orders or complaints, or in the stumbling, incoherent reading aloud of his newspaper. Mary was a silent woman herself and a lover of silence. But John liked to hear the sound of his voice; he liked to shout at her; to call for her from one room to another; above all, he liked to hear his voice reading the paper out loud to her in the evening. She dreaded that most of all. It had lately seemed to jar on her nerves till she felt she must scream aloud. His voice going on and on, raucous and sing-song, became unspeakably irritating. His "Mary!" summoning her from her household work to wherever he happened to be, his "Get my slippers," or "Bring me my pipe," exasperated her almost to the point of rebellion. "Get your own slippers" had trembled on her lips, but had never passed them, for she was a woman who could not bear anger. Noise of any kind appalled her. She had borne it for ten years, so surely she could go on with it. Yet today, as she gazed hopelessly at the wintry country side, she became acutely conscious that she could not go on with it. Something must happen. Yet what was there that could happen? It was Christmas next week. She smiled ironically at the thought. Then she noticed the figure of her husband coming up the road. He came in at the gate and round to the side-door. She went slowly in answer to the summons. He held a letter in his hand. "Met the postman," he said. "From your aunt." She opened the letter and read it in silence. Both of them knew quite well what it contained. "She wants us to go over for Christmas again," said Mary. "She's as deaf as a post. She's 'most as deaf as her mother was. She ought to know better than to ask folks over when she can't hear a word any one says." Mary said nothing. He always grumbled about the invitation at first, but really he wanted to go. He liked to talk with her uncle. He liked the change of going down to the village for a few days and hearing all its gossip. He could quite well leave the farm to the "hands" for that time. The Crewe deafness was proverbial. Mary's great-grandmother had gone stone deaf at the age of thirty-five; her daughter had inherited the affliction and her grand-daughter, the aunt with whom Mary had spent her childhood, had inherited it also at exactly the same age. "All right," he said at last, grudgingly, as though in answer to her silence, "we'd better go. Write and say we'll go." It was Christmas Eve. They were in the kitchen of her uncle's farmhouse. The deaf old woman sat in her chair by the fire knitting. Upon her sunken face there was a curious sardonic smile that was her habitual expression. The two men stood in the doorway. Mary sat at the table looking aimlessly out of the window. Outside, the snow fell in blinding showers. Inside, the fire gleamed on to the copper pots and pans, the crockery on the old oak dresser, the hams hanging from the ceiling. The deaf woman never stirred. Still there was no response upon the enigmatic old face by the fireside. She turned slightly towards the voice. "Get them photos from upstairs to show John," he bawled. "What about boats?" she said. Mary looked from one to the other. The man made a gesture of irritation and went from the room. "It's quicker to do a thing oneself," he grumbled. "They're what my brother sent from Switzerland, where he's working now. It's a fine land, to judge from the views of it." John took them from his hand. "She gets worse?" he said nodding towards the old woman. She was sitting gazing at the fire, her lips curved into the curious smile. Her husband shrugged his shoulders. "Aye. She's nigh as bad as her mother was." "Aye. It takes longer to tell her to do something than to do it myself. And deaf folks get a bit stupid, too. Can't see what you mean. They're best let alone." The other man nodded and lit his pipe. Then James opened the door. "The snow's stopped," he said. "Shall we go to the end of the village and back?" The other nodded, and took his cap from behind the door. A gust of cold air filled the room as they went out. Mary took a paper-backed book from the table and came over to the fireplace. She started. It was not the sharp, querulous voice of the deaf old woman, it was more like the voice of the young aunt whom Mary remembered in childhood. The old woman was leaning forward, looking at her intently. "Mary! A happy Christmas to 'ee." And, as if in spite of herself, Mary answered in her ordinary low tones. "The same to you, auntie." "Aunt! Can you hear me speaking like this?" The old woman laughed, silently, rocking to and fro in her chair as if with pent-up merriment of years. "Yes, I can hear 'ee, child. I've allus heard 'ee." Mary clasped her hand eagerly. "Ay. I'm cured as far as there was ever anything to be cured." "I was never deaf, child, nor never will be, please God. I've took you all in fine." Mary stood up in bewilderment. The old woman chuckled again. "No, nor my mother—nor her mother neither." Mary shrank back from her. "I—I don't know what you mean," she said, unsteadily. "Have you been—pretending?" "I'll make you a Christmas present of it, dearie," said the old woman. "My mother made me a Christmas present of it when I was your age, and her mother made her one. I haven't a lass of my own to give it to, so I give it to you. It can come on quite sudden like, if you want it, and then you can hear what you choose and not hear what you choose. Do you see?" She leant nearer and whispered, "You're shut out of it all—of having to fetch and carry for 'em, answer their daft questions and run their errands like a dog. I've watched you, my lass. You don't get much peace, do you?" "Oh, I don't know what to think," she said. "I—I couldn't do it." "Do what you like," said the old woman. "Take it as a present, anyways—the Crewe deafness for a Christmas present," she chuckled. "Use it or not as you like. You'll find it main amusin', anyways." And into the old face there came again that curious smile as if she carried in her heart some jest fit for the gods on Olympus. The door opened suddenly with another gust of cold air, and the two men came in again, covered with fine snow. "I—I'll not do it," whispered Mary, trembling. "We didn't get far. It's coming on again," remarked John, hanging up his cap. The old woman rose and began to lay the supper, silently and deftly, moving from cupboard to table without looking up. Mary sat by the fire, motionless and speechless, her eyes fixed on the glowing coals. Mary. "It come on my wife jus' when she was that age." Then he said loudly, "Mary!" A faint pink colour came into her cheeks, but she did not show by look or movement that she had heard. James looked significantly at her husband. The old woman stood still for a minute with a cup in each hand and smiled her slow, subtle smile. I knew she had written many books, but have only read Just William. I enjoyed this one.